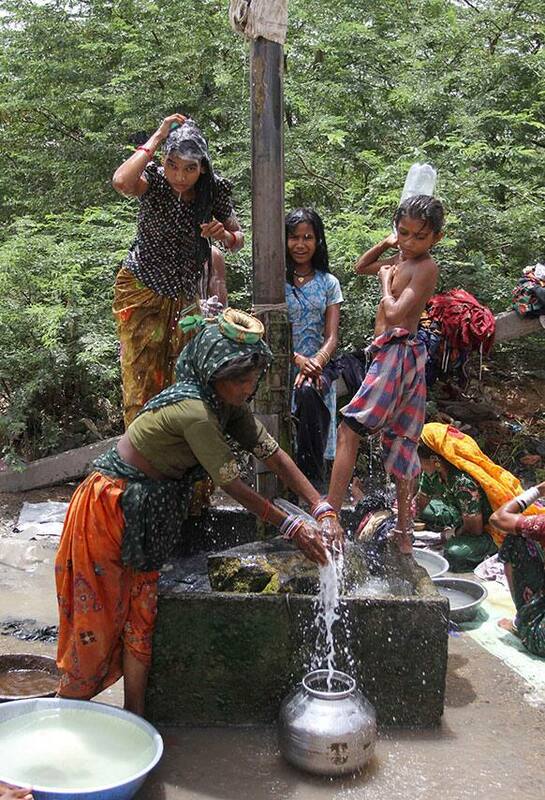 An Indian woman fetches drinking water from a leaking pipe as others bathe under it on the outskirts of Gandhidham in the Kutch district of Gujarat state. 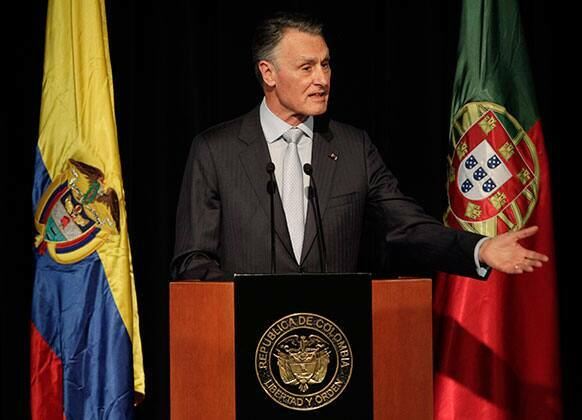 Portugal`s President Anibal Cavaco Silva delivers a speech at the opening ceremony of the International Book Fair in Bogota, Colombia. Argentina Falklands War veteran, Marcelo Wytrykusz, burns a Union Jack in protest in Buenos Aires, Argentina. 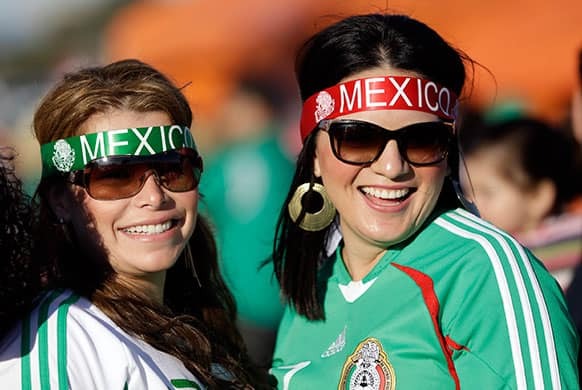 Mexico fans smile before an international friendly soccer match against Peru, in San Francisco. 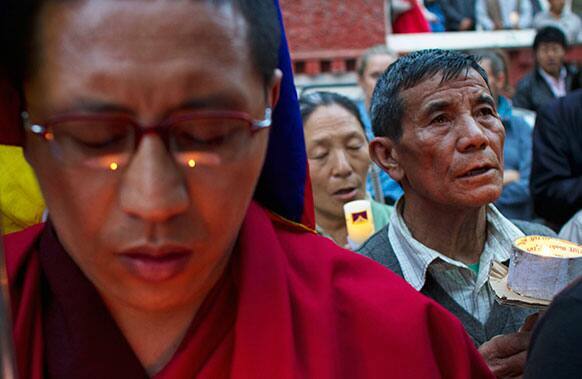 Exile Tibetans hold a candlelit vigil in candlelit vigil in Dharmsala, India, Wednesday, April 17, 2013. Exiles claim that another Tibetan, a 20-year-old woman , died after self-immolating in Eastern Tibet. 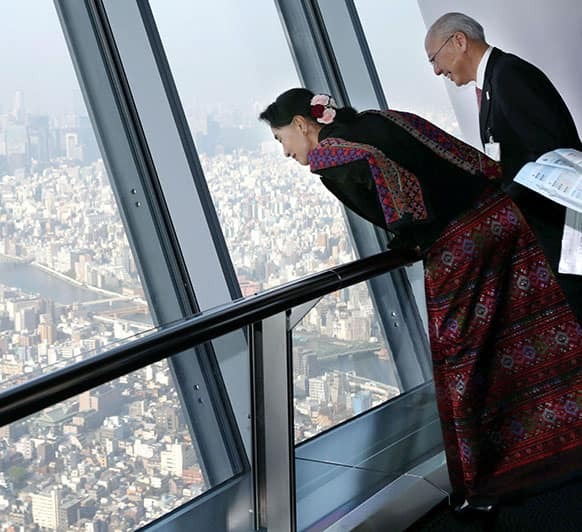 Myanmar opposition leader Aung San Suu Kyi, left, views from the 350 meters(382 yards)-high observation deck at the Tokyo Skytree in Tokyo. 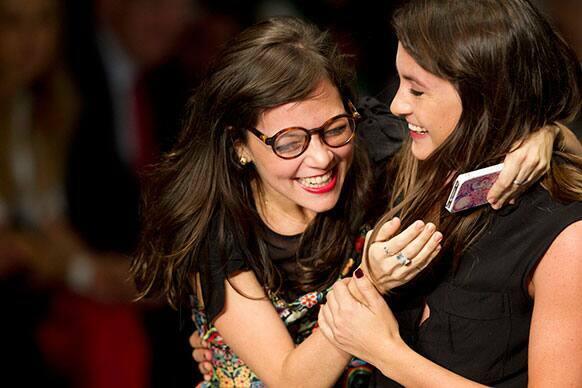 Mexican singer Ximena Sarinana, left, and Mexico`s designer Alejandra Quesada smile at a Mercedes Benz Fashion Week Mexico show in Mexico City. 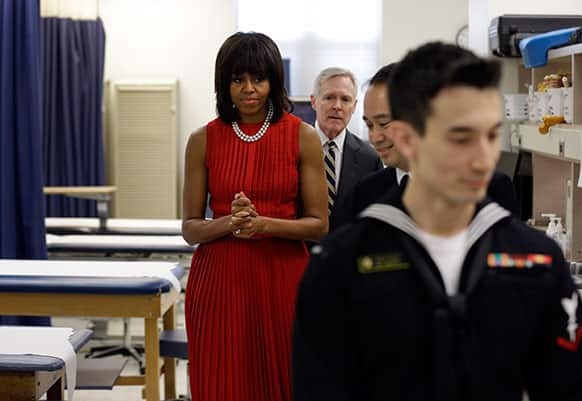 First lady Michelle Obama and Navy Secretary Ray Mabus, back, tour an orthopedic room with midshipmen at the US Naval Academy in Annapolis, Md. 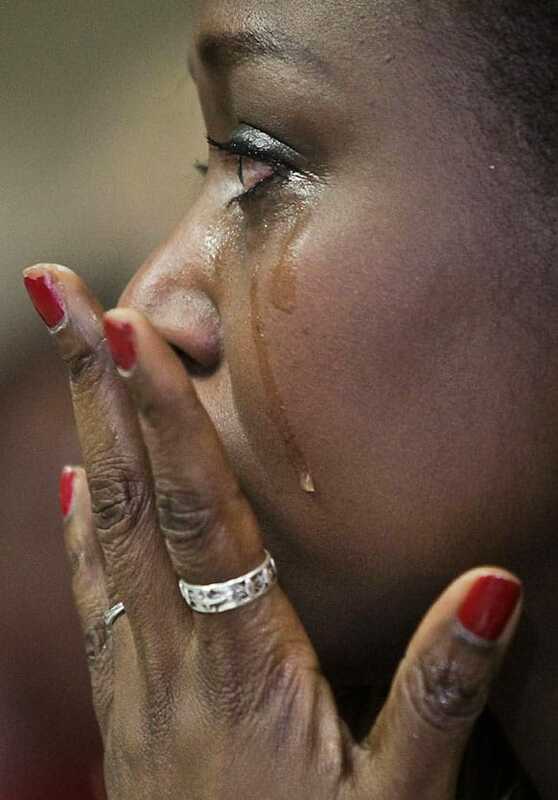 Immaculee Ilibagiza wipes away tears as she views a video message from President Obama during the U.S. Citizenship and Immigration Services naturalization ceremony in New York. 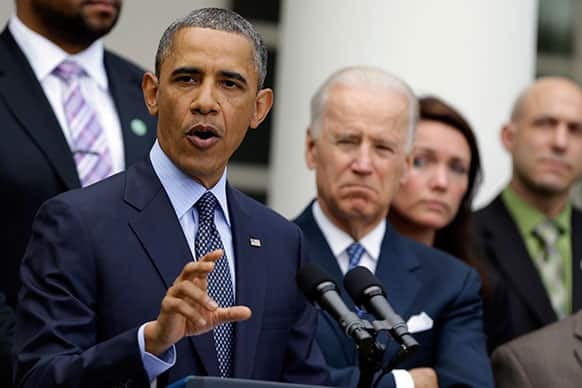 President Barack Obama, next to Vice President Joe Biden, gestures as he speaks during a news conference in the Rose Garden of the White House, in Washington. 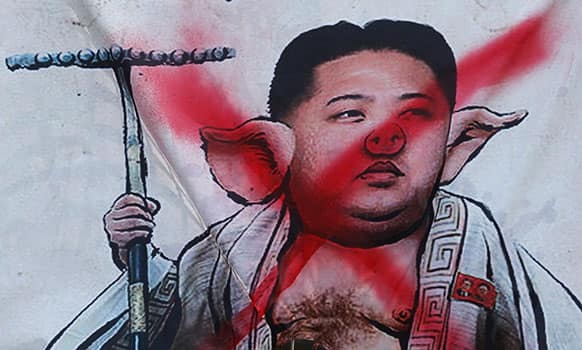 A banner with picture of North Korean leaders Kim Jong-Un is displayed by South Korean protesters during an anti-North Korea protest rally in downtown Seoul, South Korea. 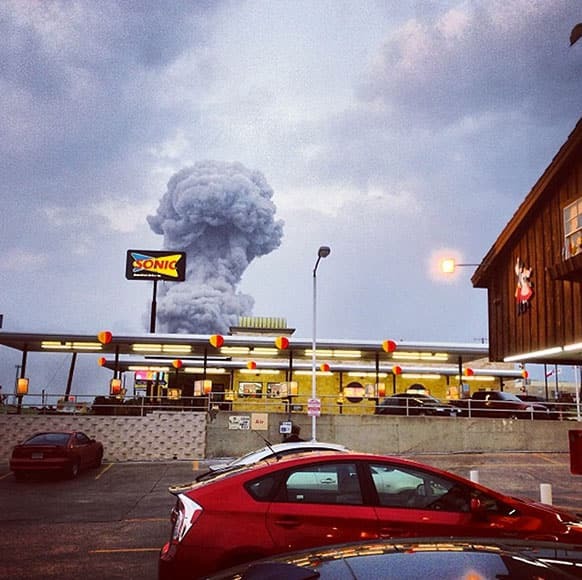 A plume of smoke rises from a fertiliser plant fire in West, Texas. An explosion at a fertiliser plant near Waco Wednesday night injured dozens of people and sent flames shooting high into the night sky, leaving the factory a smoldering ruin and causing major damage to surrounding buildings. 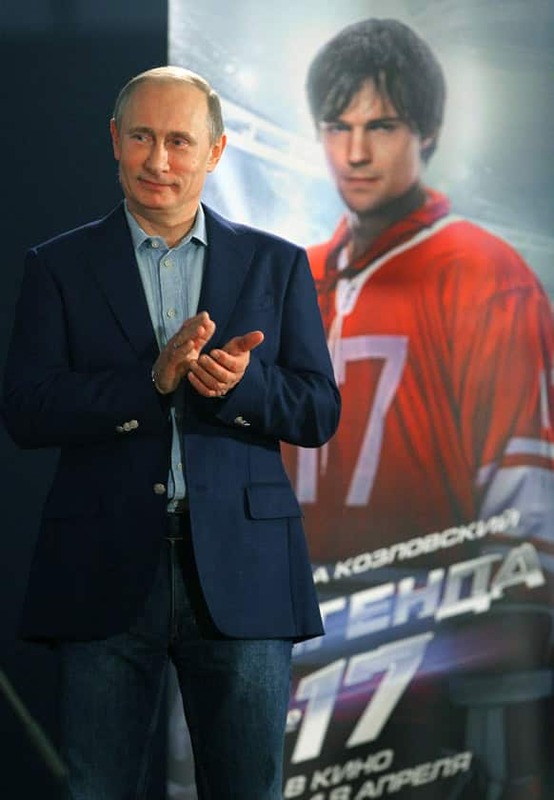 Russian President Vladimir Putin applauds after the premier of the movie " Legend # 17" at Primorsky sanatorium movie theater outside the Black Sea resort of Sochi, Russia. 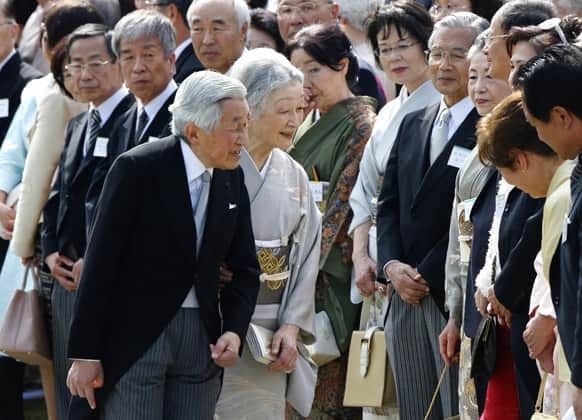 Japan`s Emperor Akihito and Empress Michiko greet guests during a spring garden party at the Akasaka Palace imperial garden in Tokyo. Pakistan`s former President and military ruler Pervez Musharraf leaves the High Court in Islamabad, Pakistan. 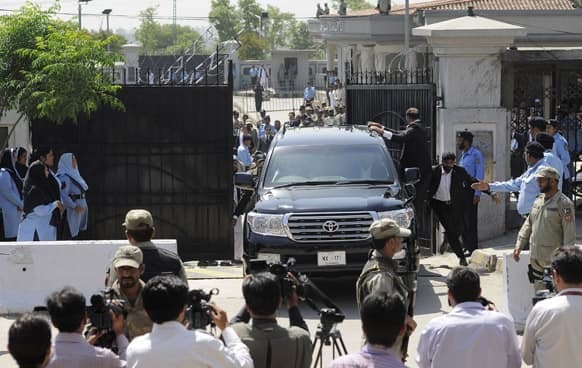 Musharraf and his security team pushed past policemen and sped away from a court. 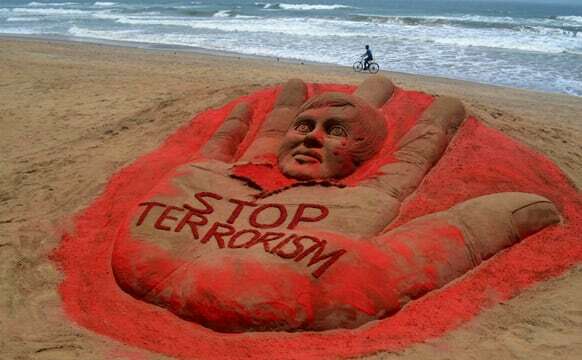 A cyclist pedals past a sculpture with a message against terrorism, created after attacks in Boston and Bangalore, at the golden sea beach in Puri. 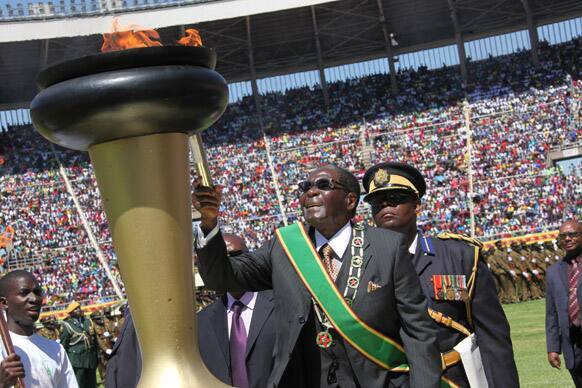 Zimbabwe`s President Robert Mugabe lights the independence flame during Zimbabwe`s 33rd independence celebrations in Harare. 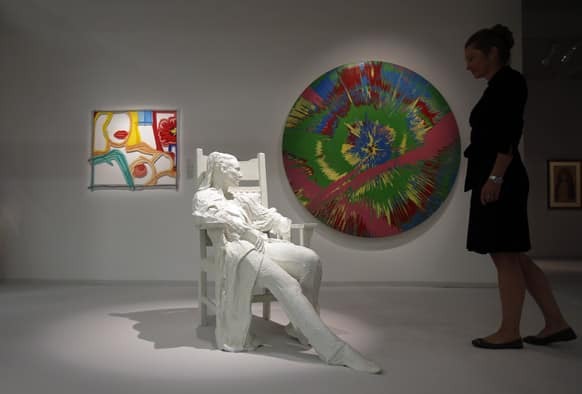 A visitor watches the sculpture `Woman in Armchair` made of bronze with white patina by US artist George Segal at the ART COLOGNE fair in Cologne, Germany. 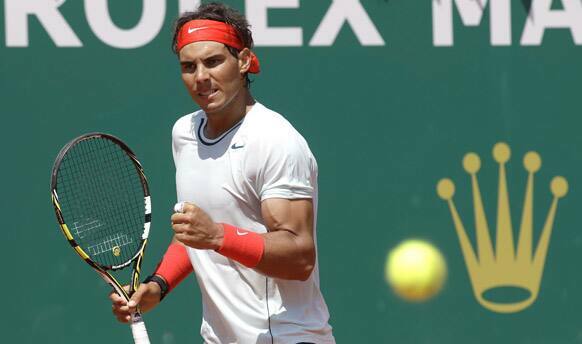 Spain`s Rafael Nadal reacts during his match against Philipp Kohlschreiber of Germany at the Monte Carlo Tennis Masters tournament in Monaco. 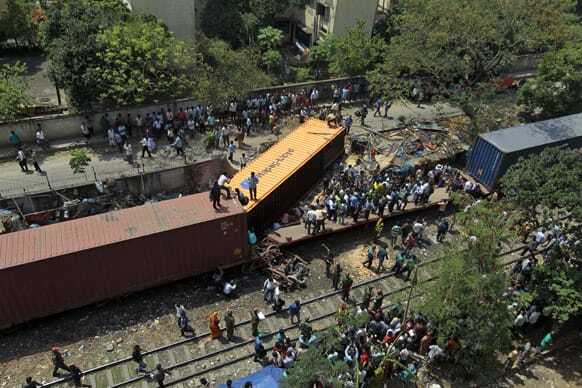 Bangladeshi people gather after three carriages of a container train derailed with one of the containers slamming into an adjacent slum in Dhaka. One person died and at least five were injured in the incident, police said. 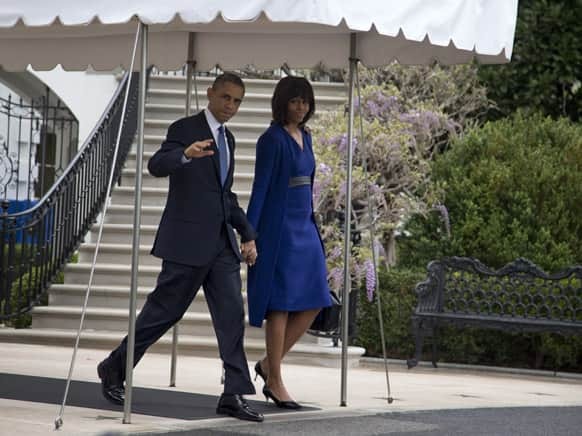 Barack Obama, accompanied by Michelle Obama, waves to media as they leave the White House to board the Marine One helicopter, en route to Andrews Air Force Base and onto Boston where they will attend a service dedicated to those who were gravely wounded or killed in the bombing. 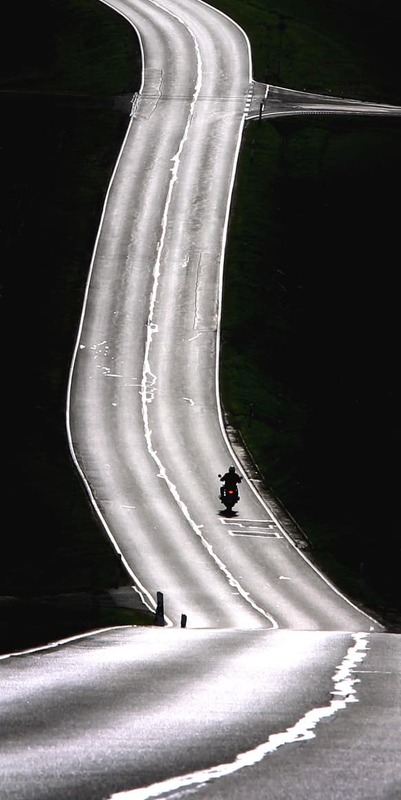 A motorcyclist rides along the street which is illuminated by the sun near Remlingen, Germany. 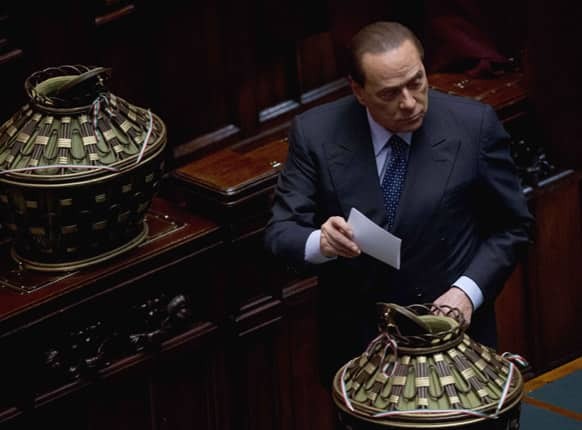 Italian former Premier Silvio Berlusconi casts his ballot for a new president whose first job will be to seek the formation of a new government after inconclusive elections, in Rome. 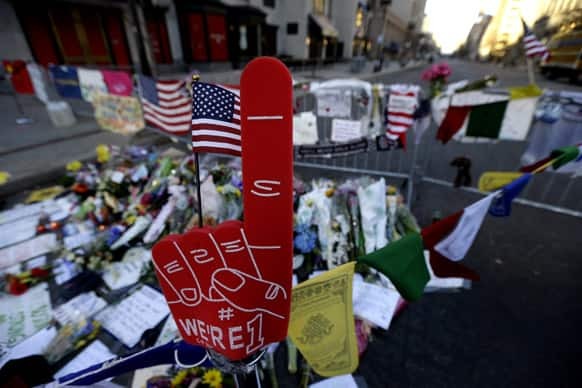 A foam finger stands at a makeshift memorial on Boylston Street in Boston, near the blast site of the Boston Marathon explosions. 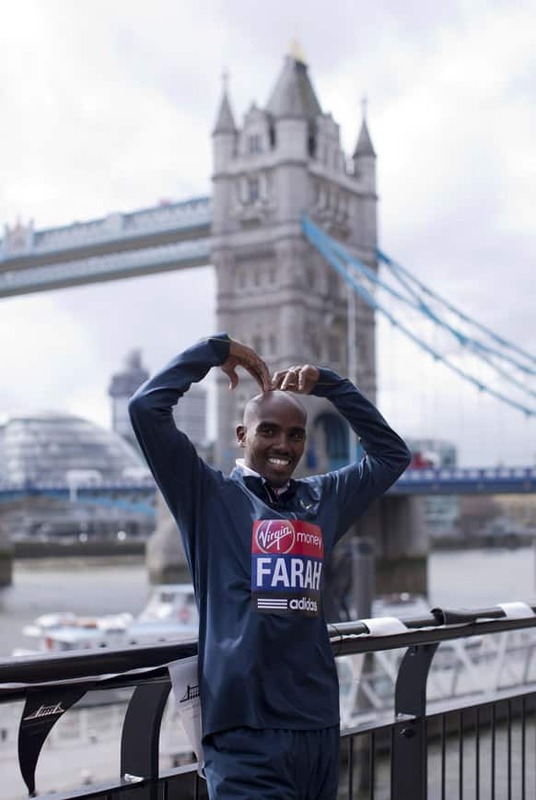 British runner Mo Farah, the reigning Olympic 5,000 and 10,000 meter distance champion poses for photographers during a media opportunity backdropped by Tower Bridge in London. 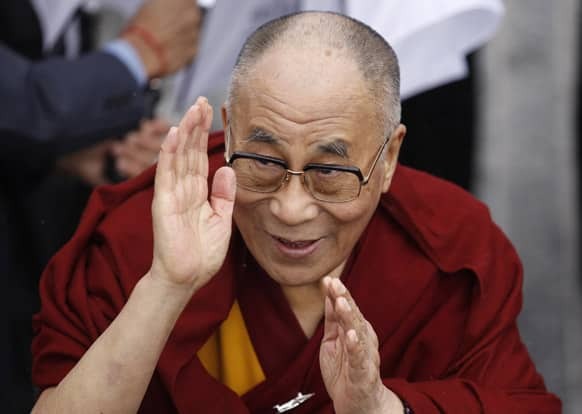 Exiled Tibetan spiritual leader the Dalai Lama greets people after walking over the Londonderry Peace Bridge, during a visit to Londonderry, Northern Ireland.